99 Reasons Why you should read this. Caroline Smailes‘ new novel, 99 Reasons Why, has been creating quite a stir in the weeks building up to its publication last Monday, the media interest has focused on the book’s unique selling point. 99 Reasons Why has 11 different endings, the reader selecting one of the eleven via a spinning wheel on the iTunes/iBooks version or a series of questions on the Kindle ebook. Nine endings are included in the ebook, with ending 10 to be handwritten and auctioned for charity and ending 11 being ‘given away,’ in both senses of the phrase, on blogs all across the internet. 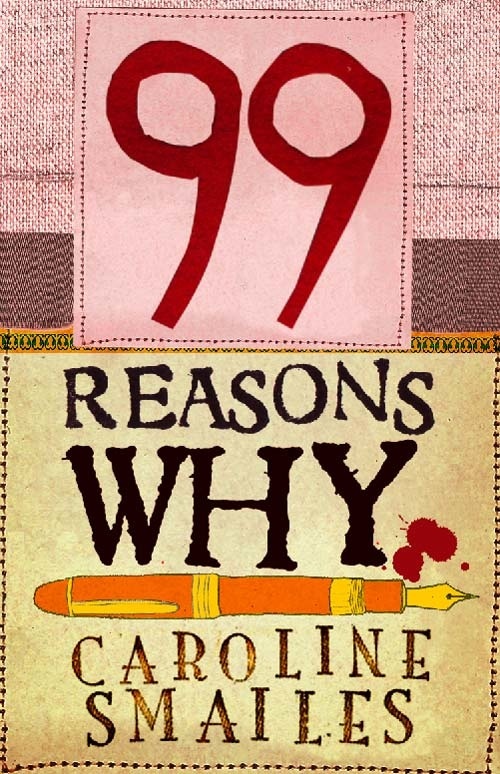 99 Reasons Why is ‘a gritty and heartfelt novella with a twist: 99 Reasons, 11 endings, your pick. Kate isn’t like other 22 year olds. She’s got a job to do for her Uncle Phil. Each day, she spies on The Kevin Keegan Day Nursery across the road from her bedroom window, writing down all of the comings and goings in her notebooks. That’s how she spots her little girl in the pink coat. She likes her, and it isn’t long before Kate asks her mam to get her for her. Plans are made. The book is already receiving some great reviews on Amazon. I’ve been a fan of Caroline’s work for a while now. Her debut novel ‘In Search of Adam’ made my recommended reading list back in September 2010 and my list of the best fiction I read that year. Those of you viewing this post on the main page of my blog will also be able to see from my Current Reading sidebar widget that 99 Reasons Why is my current novel choice. Look forward to a review very soon. In the meantime, I am excited to be able to share ending 11 with you. Read, enjoy and head to Amazon or iTunes to purchase the ebook for the reader of your choice. It’s been six days since the little girl in the pink coat went missing and me Uncle Phil’s in me bedroom. We’ve been watching the little girl in the pink coat’s mam on the news. She was appealing to the public for witnesses. ‘Didn’t realise she had a mam,’ I says, looking at me telly. ‘Everyone’s got a mam, pet,’ me Uncle Phil says to me. ‘She sold her story to The Sun,’ I says, looking at me telly. ‘Got a few quid,’ me Uncle Phil says to me. ‘She wanted nowt to do with that bairn before all this,’ me Uncle Phil says, looking at me telly. ‘Do you know where she is?’ I asks me Uncle Phil. ‘Belle?’ me Uncle Phil asks me. ‘Can I be her mam?’ I asks me Uncle Phil. ‘No, pet, you’re a filthy whore,’ me Uncle Phil says to me. ‘Can you make Andy Douglas come back, Uncle Phil?’ I asks me Uncle Phil. Me Uncle Phil shakes his head. ‘I love him,’ I tell me Uncle Phil. ‘Andy Douglas is your brother, pet. You didn’t seriously think Princess Di was your mam, did you?’ me Uncle Phil asks me. ‘You’re a cradle snatcher just like your mam,’ me Uncle Phil says to me. ‘Your mam miscarried when she found out I’d been banging Betty Douglas. Betty was expecting you,’ me Uncle Phil says to me. ‘When you was born, your mam went mad and I ended up buying you from Betty Douglas for ninety-nine quid,’ me Uncle Phil says. ‘Ninety-nine quid?’ I asks me Uncle Phil. ‘I paid a hundred but got a quid change for some chips for your mam and dad’s tea,’ me Uncle Phil says to me. ‘You bought me?’ I asks me Uncle Phil. I’m a little bit sick in me mouth. ‘I’m pregnant,’ I says to me Uncle Phil. ‘I’m pregnant with me brother’s baby,’ I says, and then I throws up on me purple carpet. ‘You’re a filthy whore,’ me Uncle Phil says to me. ‘What am I going to do?’ I asks me Uncle Phil. ‘You’re going to have the baby,’ me Uncle Phil says to me. ‘Have me brother’s baby?’ I asks me Uncle Phil. ‘Then I’m giving it to Betty Douglas to bring up,’ me Uncle Phil says to me. ‘You what?’ I says to me Uncle Phil. ‘It’s the right thing to do,’ me Uncle Phil says to me. ‘I can’t—’ I says to me Uncle Phil. ‘It’s either that or I’ll make you disappear,’ me Uncle Phil says to me. I’m thinking, they’re all a bunch of nutters. Best British Short Stories cover.